Every day on St. George Island is a great day, but this was one I will remember. After a morning rain, the sky cleared and a stiff off shore wind [from the northwest] was blowing when my dog Mari and I were heading home along the shore. Mari was spooking Willets and Sanderlings and I was simply bracing against the gusts. In my peripheral vision was a flash of orange. An incoming migrating Northern Oriole glided right onto the top of a 4-foot wave, was tossed onto shore and hit by a second wave. Realizing the little male was a going to be a goner with the next wave, I shifted into "high gear" and swooped him up. He was caked with sand in eyes, ears, nares, and underwing. His eyes were half mast and he was exhausted, soaked with salt water, and very cold. I ran home ([a] relative [term when one has] 7-decade knees), rinsed his eyes and beak, and wrapped him in layers of toilet paper to soak water off his feathers. I also offered him fresh water, sugar water, and fresh orange juice. He let me dust off much of the sand. He was exhausted, and seemed to like the warmth of my hand. When he would take no more fluids and was a bit drier, Don and I put him in a beer box in the laundry room where it is warm. He slept or rested for over 4 hours. Once he began to move a bit, Don put a small branch in the box so he could perch normally, rather than sit "flat footed". After a few more feedings of juice his eyes were open, he perched on the branch, and was shaking and preening his feathers and ridding himself of residual sand. Thinking that this guy had had a rough day, rather than releasing him on the island to face a flight across the sound into the wind, we drove him across the causeway and released him on the NOAA Estuary Reserve. He took one look at me and was "outta here"…headed north! He was beautiful! Wonder what tale he will share on his breeding ground? Over the years, probably every one of us has been in a situation in which we’ve found a bird in distress. 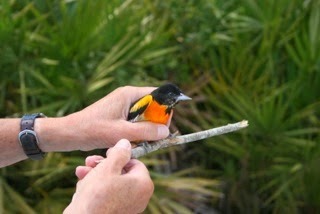 Sandy Gillum obviously has had more opportunities to deal with birds in the hand than most of us, and knew exactly what to do to give this beautiful little oriole his best chance at survival. It’s becoming in vogue for people to ridicule wildlife rehabilitation as wasting time, energy, and money on individual birds that were probably best weeded from the wild populations anyway. But the bizarre vagaries of weather during spring and fall migration, along with the huge number of human-created hazards, take out a great many fit birds. The lessons we learn in helping individual birds in need inform our conservation techniques when we’re working with endangered species. I’d suggest that one of the finest components of our essential humanity is compassion informed by knowledge. My friend Sandy embodies both a warm heart and a keen mind. Her fast and knowledgeable response kept a bird in need from being reduced to a bit of beach detritus, leaving this earth a little richer and more vivid.